Remember back in November 2015 I took a weekend-long workshop at Maiwa in dyeing? 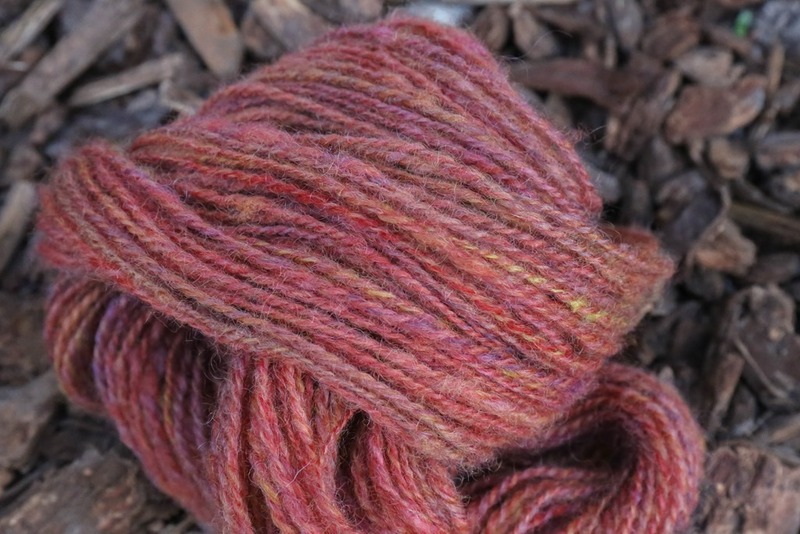 Then I had a weekend of dyeing fun a few weeks later and created a gorgeous skein of hand-painted Romney in natural dyes. I was really proud of the saturation of colours I was able to achieve, based on some direction from my Maiwa instructor. I had taken careful notes and was able to do exactly what she thought would work for the effect I wanted! 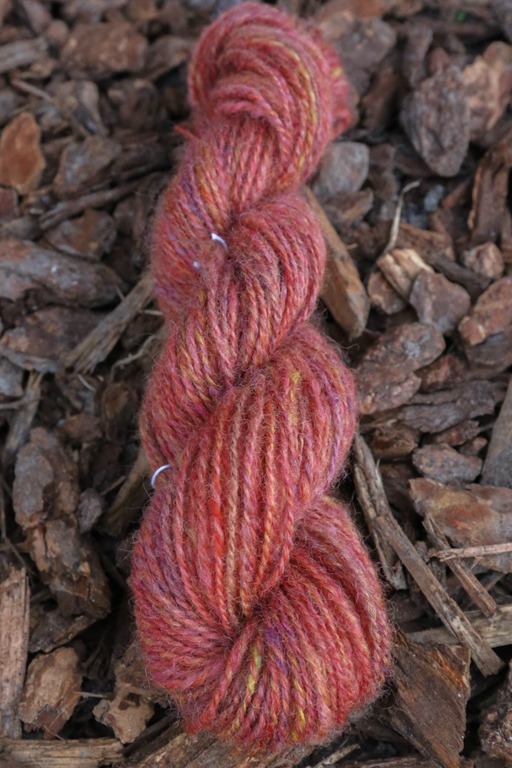 The problem was that due to my inexperience with dyeing, I severely fulled the skein. Almost felted it. I didn’t realise this until I was working with the fibre a few months later, hoping to spin it up into a gorgeous fractal. It wasn’t going to happen. The fibres were too compressed and stuck together to spin smoothly at the wheel. So I put it aside and moved onto other things. I don’t even think I really discussed it on the podcast because it was just a little blip during naptime one day. No problem, I thought, I’ll come back to it and it’ll be fine. Over the next few weeks, however, I kept coming back to it again and again. Completely smitten with the colours, particularly the Marigold, I figured there must be a way to get the fibres to open up again … right? Or was it fit for the compost? In my ever-curious mind, I kept coming back to the idea of drum carding the fibre to open it up again. The reason that kept me from actually putting it through the drum carder was two-fold. 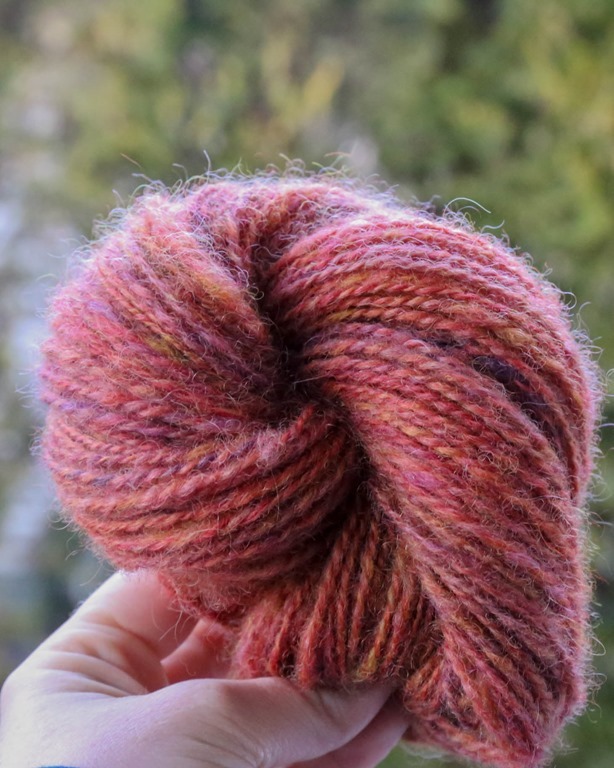 One, I didn’t want the colours to blend together into a homogenous skein, and two, I wasn’t certain it was very clean fibre from the Madder particles in it and didn’t want to mess up my equipment. But I almost became obsessed about putting it through the carder because the only other choices consisted of composting or long-term storage. And those didn’t seem viable. What’s that saying? It’s not over until it works out? That’s what my Mom always said to us growing up, anyhow. I finally decided to put a small sample through the drum carder and Voila! It worked! It would turn the fibre into a blended homogenous skein but it made the fibre spin-able again. Opening up the fibre and teasing some air into it, I was able to make small batts. I passed them through 3 times each to blend them well and open up the fibre as much as possible. Miraculously, it worked like a hot-damn. 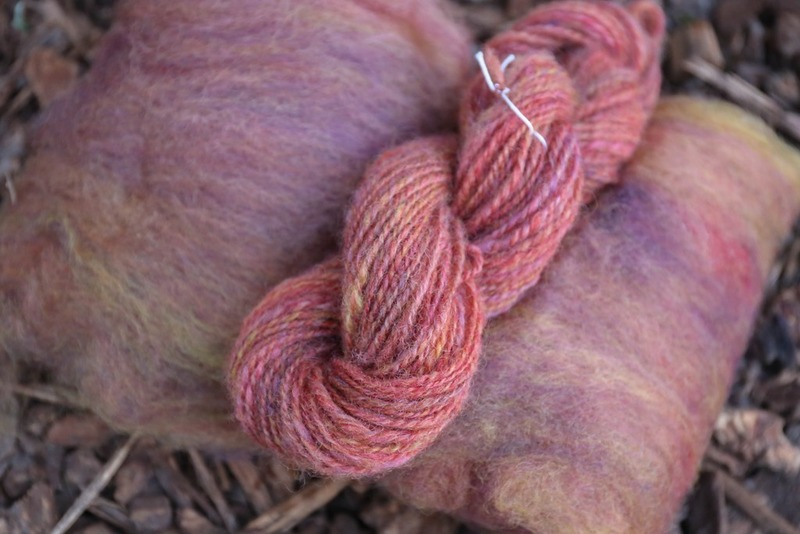 I sampled a small amount on my new Turkish spindle, which I had picked up the day before at Fibres West. 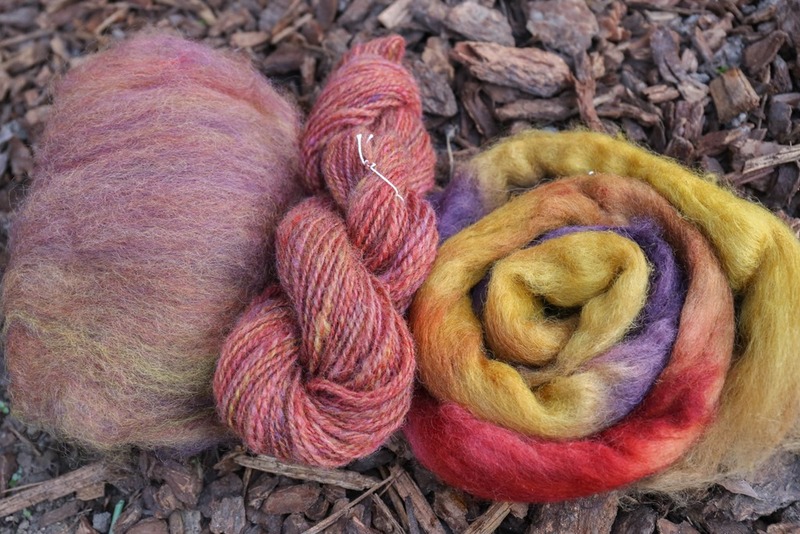 It was lovely spinning on the spindle and I’m planning the rest of the fibre on the spindle as well. 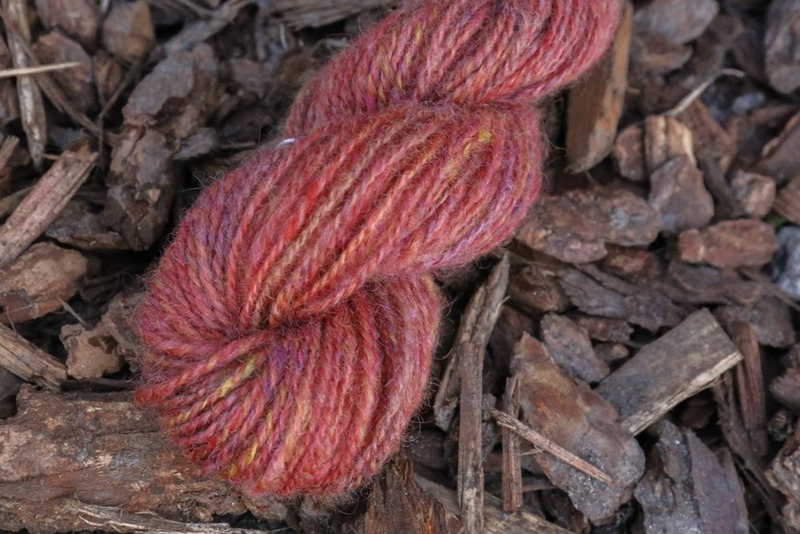 The weight of the spindle created a lofty, airy 2-ply yarn that is really lovely and soft. The halo is lovely as well. For my first skein of yarn off a spindle, I’m happy with the consistency. It was difficult at times to keep my spinning consistent due to the fibre preparation of the batt but a pinch, pull forward, let it go motion worked really well. I’m not completely sure how much this little skein weighs or its yardage, and it is far from perfect. There are a few knots, and spliced sections where my plying ball didn’t match up well and I had to break a single, match them up and carry on plying. Overall, however, I am really excited about the results and looking forward to continuing with this spin. I have four more batts made and need to make about 8 more from the remaining fibre. Theoretically I have 1 pound of this Romney but the waste from the sections of fibre that really were felted will result in some waste. It really isn’t over until it works out. Do you have a project that you thought was ruined but ended up working out? Thanks, Rachel, for sharing your obstacles with this yarn. This is the way we learn best through our challenges. It is reassuring to all of us that everyone comes up against a problem that needs a solutuin. Absolutely! And if we can learn from them, I think it’s even more important to share. Thank you! It was so helpful when I was a new spinner to see that progression so I’m thankful it’s helpful for others too!! Wow, beautiful save! 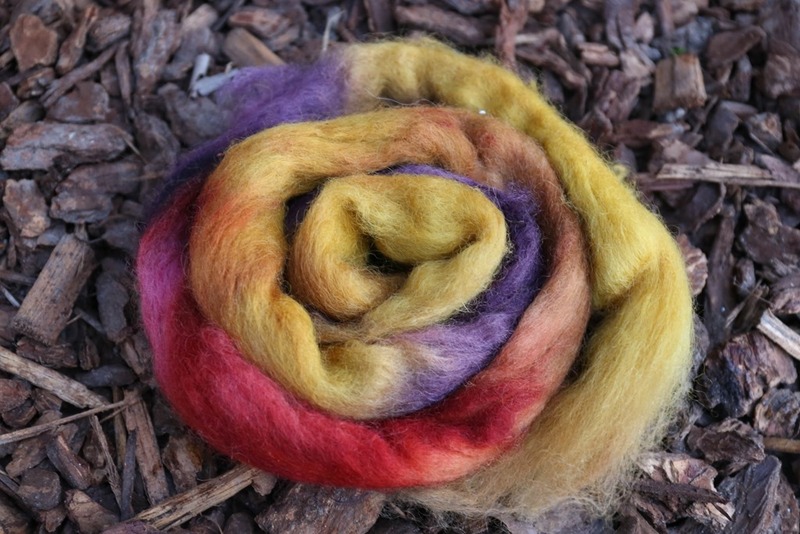 I have some Sheepspot Bond/Silk pencil roving that I am struggling with. I am not sure why, but maybe I need to try spinning it on a spindle instead of my wheel! There’s definitely something to be said for changing out the tool if it’s not working. Did you give it a try? Any difference??? What beautiful colors you got from that batt! Lovely!